A couple of days ago I posted an entry depicting the people, light and their shadows inside this same venue. You can read my words and see the images here. 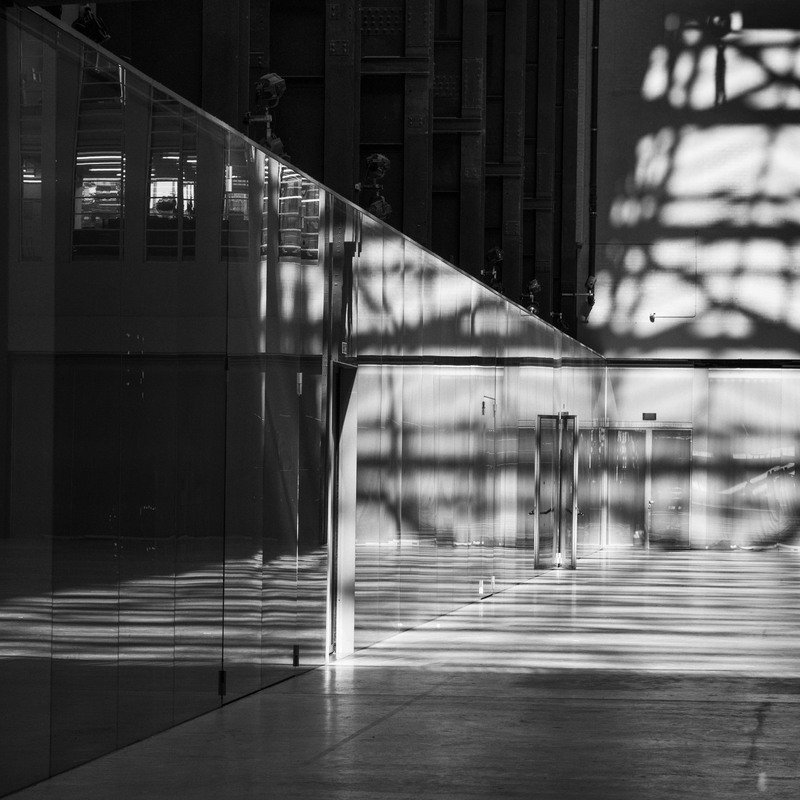 When I first arrived at Tate Modern I was fascinated by the way the afternoon sun came through the vast roof light above me and the tall vertical windows in the west wall. 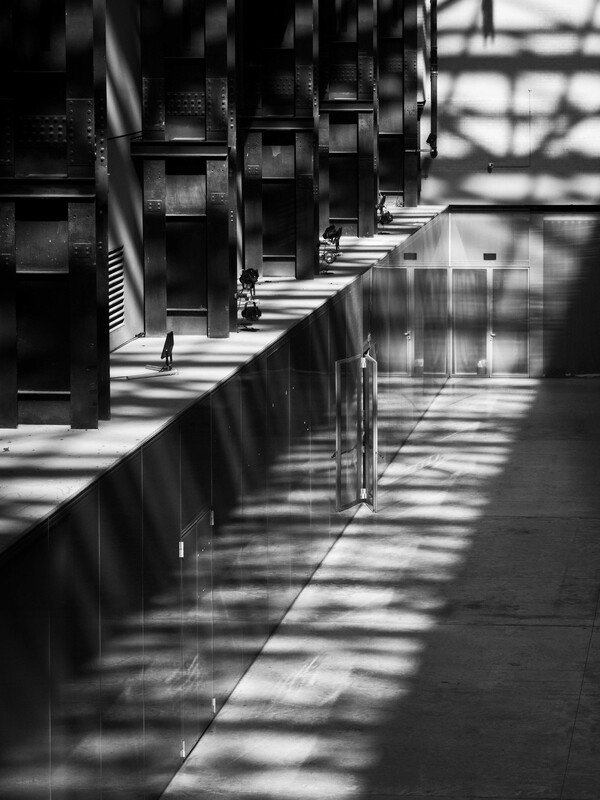 Together they created many interesting shadows and patterns of light on the building’s structure, the textured concrete floor and in some cases the reflective surfaces enclosing the Turbine Hall. For your information this hall is 152m long and 35m high; it’s huge. I liked the view at the head of this post, but I did wonder what it would be like if taken at ground level. The next shot is looking into the same corner of the hall, but has a more abstract feel to it. 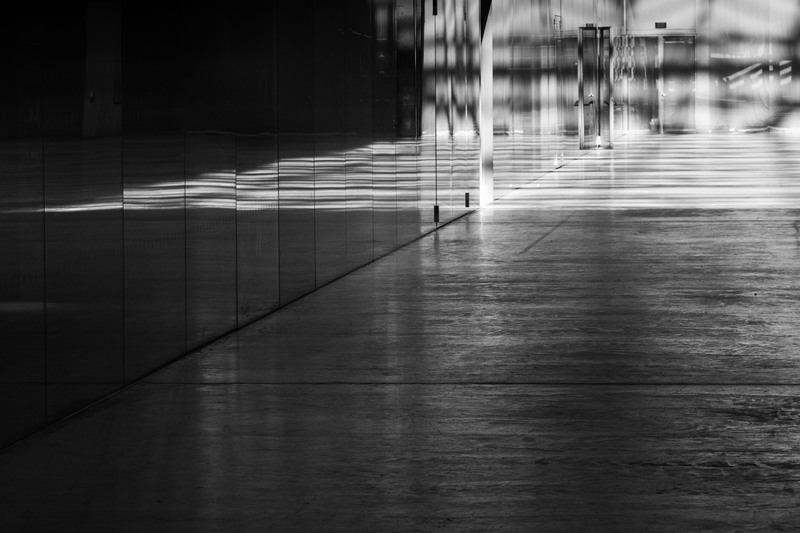 It was then that I noticed the light and shadows falling on the floor being mirrored in the the ‘polished’ wall surface. Would a slightly different view point and a more abstract composition give me an image which truly bought all these elements together and what would be the result? Here is the final image in this short series of three. You may wish to click on the picture to see a larger version. It has a rather surreal look about it. There appears to be a layer of ‘floating light’, hanging above the floor. It’s an optical illusion of course but the way the light and shadows are being mirrored produces this effect and for me this is the most visually interesting of the three. 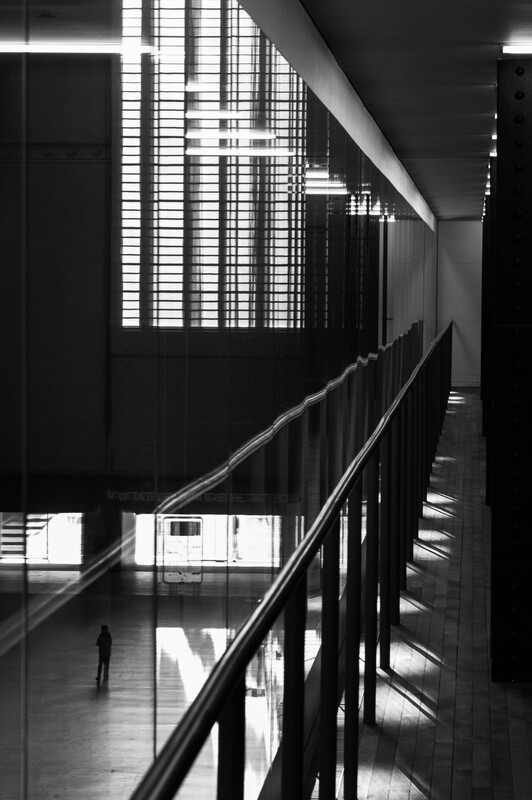 Here are two other photographs taken inside the Turbine Hall. 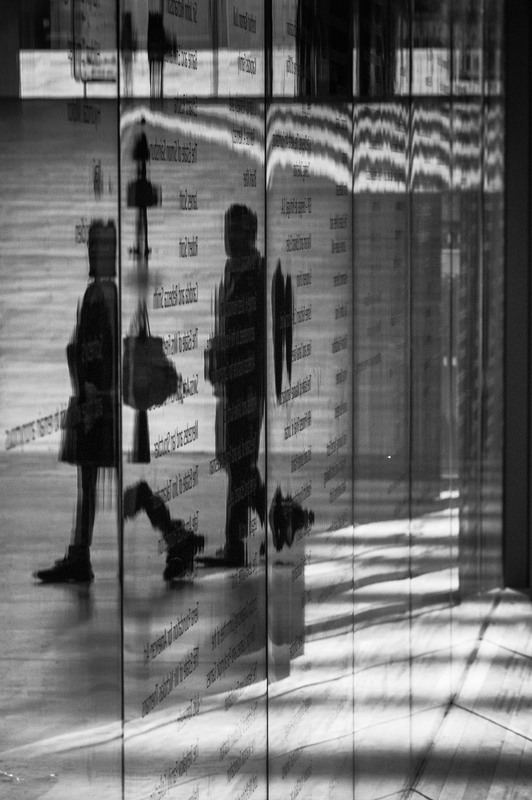 Here again I like the way the people behind the glass are distorted whilst the light makes interesting patterns, adding further interest to the overall composition. Finally here is a shot looking towards the tall vertical windows. Taken through glass the reflection of the hand rail is distorted and a small figure stands alone in the bottom left hand corner. A point of interest but also necessary to give scale to the image. I only spent an hour or so wandering around, but I am inspired to go back. Arrive early and leave late – Watching, observing and waiting for the light to change direction and intensity during the course of the day. Waiting for a suitable person or a group of people to be in the optimum place, moving in the right direction to enhance the composition. When all these ingredients come together I will press the shutter, and who knows what the results may be. I can’t wait to return! All the images in this post were taken with the Leica M Monochrom using a Leica 90mm f2.4 Summarit lens, processed in Lightroom and Silver Efex Pro. Do click on any of the photos to view a larger version. Portrait of a Highland Cow – turning imagination into reality. Great images, I have to visit & have a go at capturing some images next time I am in London. Thanks Michael. It’s well worth a visit. Good luck when you go. The 4th image is my favourite. Thanks Vicki. The inclusion of people does add interest and another dimension to the photo. I think there are many more opportunities to be had from this venue, so its certainly my intention to return. Fantastic series of images, Alan. The light and its abstract nature is fascinating … a truly great place to photograph. Thanks Simon. It was inspiring and I could have spent more time there, but for the fact it was about to close and I had a train to catch!